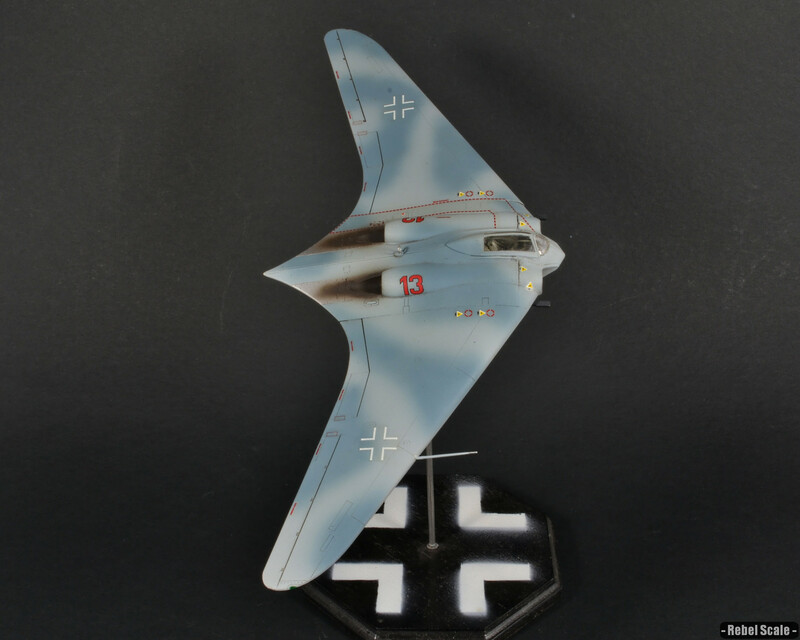 This was a fun build of Revell’s Horton Go 229. The parts fit well together; however, the canopy was quite thick and doesn’t look that great on the model. Because it never left the prototype stage, I took liberties with the painting and created my own “sky camo” from RLM76 and a darker greyish blue color. The pattern was airbrushed free-handed. 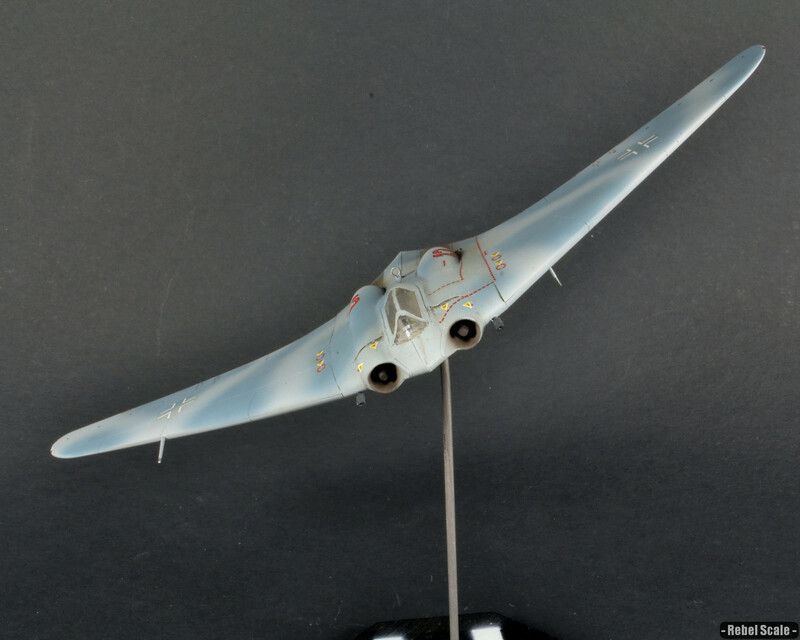 The original “flying wing” designed by the Horten brothers from their time building tailless gliders in the 30’s led them to design a stealth-capable, jet-powered, tailless fighter. 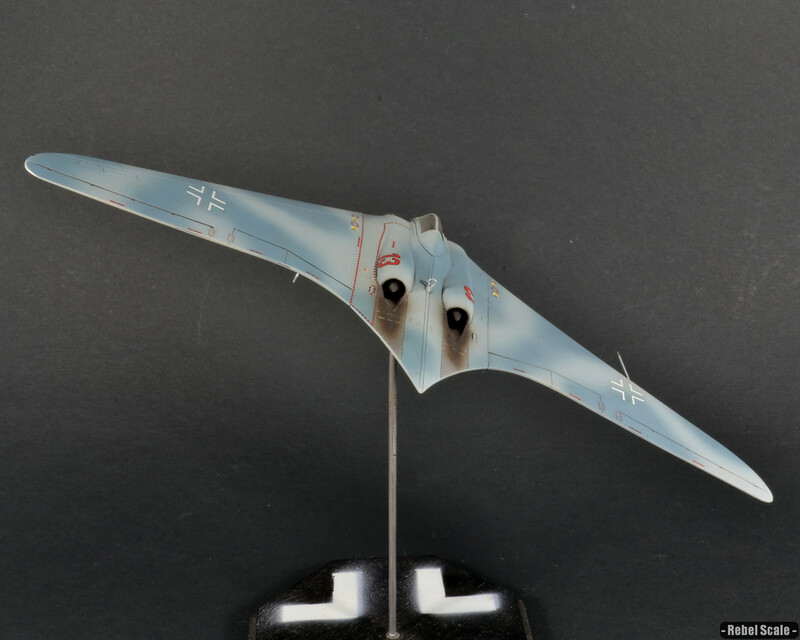 Gotha, the chosen manufacturer, built 2 prototypes of the then named Horten H.IX. The unpowered V1 glider flew in March 1944, and the jet-powered V2 flew three times in Feb. 1945. Gotha was building a larger V3 prototype (which would become the 229), when the plant and prototype were captured by advancing US forces. The Ho 229 (or Go 229) was to be the first “stealth” fighter, as well as a powerful long-range interceptor. It would carry 2 MK108 30mm cannons, capable of destroying the heavy bombers pounding Germany in the waning years of WWII. Two-seat night versions and bomber versions were also planned.